The City of London has set itself the ambitious target of becoming a zero carbon city by the year 2050. However, when it comes to energy efficiency in the residential sector, the British capital is lagging well behind its 2025 milestone of renovating 2.9 million homes, which is crucial to its overall objective for 2050, as London’s 3.35 million homes account for 36% of the city’s CO2 emissions. Similarly, many other municipalities in the United Kingdom have the mission to promote energy saving in their building stock, but only dispose of very limited resources to follow through on their goals. Through the lack of financial support provided, home owners have little incentive to engage in costly, time-consuming, and disruptive renovations. In addition, coordination and information is severely lacking on the energy efficiency renovation market. This is the experience that Russel Smith made already back in 2005 when he was planning to retrofit his own home but quickly realized that personalized and unbiased advice was essentially unavailable. He thus decided to take things in his own hands, develop an energy model for himself, and finally, set up an energy efficiency consultancy working towards filling these gaps: Parity Projects. In 2012, Parity Projects launched the unique concept of ‘RetrofitWorks’, a multi-stakeholder cooperative through which around 450 SMEs collaborate and develop delivery models for energy efficient retrofitting, thereby including community-based organisations and councils as stakeholders. 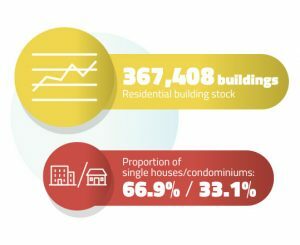 RetrofitWorks is run for and by each local community, building on existing local supply chains and services, ensuring that wealth, jobs, and skills are retained in the local area. The cooperative model allows to bring the supply and demand side of the retrofit market together; its members include both practitioners seeking work (representing the supply side) and advocates representing the interests of householders or tenants (the demand side). In order to overcome these obstacles, Parity Projects is now working with INNOVATE to develop an online One-Stop-Shop bringing practitioners, homeowners and municipalities together, and to develop an integrated energy efficiency service package for single family houses on the basis of its RetrofitWorks model in four boroughs of South London. 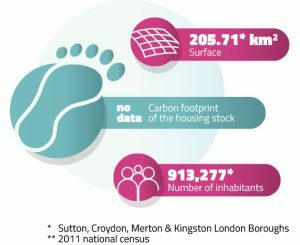 South London has the highest percentage of lowest-rated domestic Energy Performance Certificates in the capital, with a majority of the homes in the four target boroughs – Sutton, Croydon, Merton and Kingston – built before 1945. The residents in these areas are wealthier than the national average and Parity Projects is specifically targeting able-to-pay homes where financing is not the major barrier to energy efficiency renovations. While Parity Projects has selected South London as a target area, they are not attached to one city in particular but are seeking to provide ‘ready-made’ infrastructure to design, implement, and monitor and evaluate energy saving projects which can be applied in a number of municipalities throughout the UK. Rather than having each region develop their own scheme for energy renovations from scratch, Parity Projects is developing one easily exportable model, allowing to reduce both costs and workload for the cities. The objective to reduce costs for municipalities to promote energy efficiency is also reflected by the fact that the infrastructure provided by Parity Projects, comes in the form of an online rather than a physical One-Stop-Shop. Such an online platform enables clients, practitioners, and municipalities to gather information which will allow them to overcome the barriers of the retrofit market. It is based on an existing project: Parity Projects’ CROHM online portal. The online service includes a library of information about local homes in order to provide tailored advice to local residents, helping them identify the most cost-effective and appropriate energy efficiency measures. In the background this information and analysis of the visitors on the platform also help local actors (such as municipalities) to improve their marketing by targeting their outreach more efficiently. On the supply side, RetrofitWorks will allow residents to go ahead with recommendations by expanding its existing installer network and by actively searching for new partners, who can deliver finance to householders. As a cooperative, RetrofitWorks can apply for a consumer credit licence allowing it to provide both finance and financial advice to its clients. This dual approach of targeting both demand (through marketing and advice) and supply (through the expansion of RetrofitWorks) allows to bring the relevant stakeholders together, while reducing costs for all of them. Energy Cities, énergies demain (FR), Aradippou Municipality (CY), Brussels Environment (BE), AGENEX (ES), Frederikshavn Municipality (DK), Heerlen Municipality (NL), KAW (NL), Linnaeus University (SE), Litoměřice Municipality (CZ), Mantova Municipality (IT), Parity Projects (UK), Riga Energy Agency (LV).